VINTAGE COSTUME ANTIQUE JEWELRY MATCHING JEWELRY SETS - PARURES! Juliana Pink Crystal Dangle Goldtone Vintage Antique Estate Bracelet And Clip On Earrings Matching Jewelry Set - Parure For Weddings, Proms, Pageants And Parties! 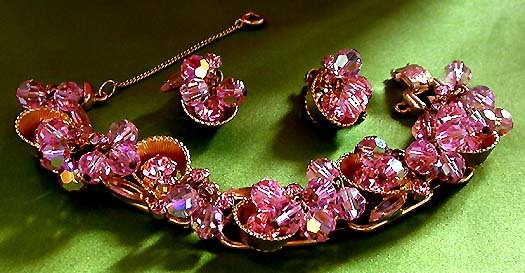 Juliana Pink Crystal Dangle Goldtone Vintage Antique Estate Bracelet And Clip On Earrings Matching Jewelry Set - Parure. 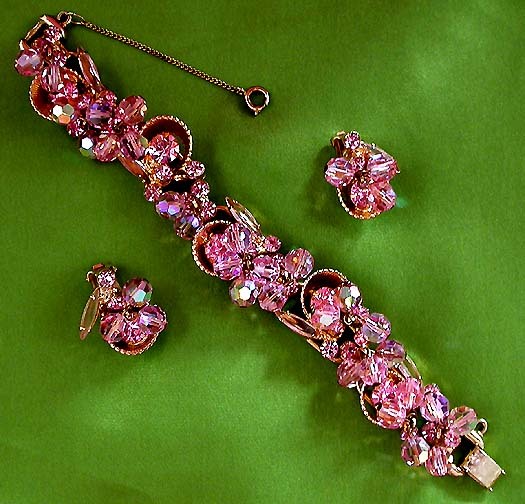 Item #S16877 - Juliana Pink Crystal Dangle Goldtone Vintage Antique Estate Bracelet And Clip On Earrings Matching Jewelry Set - Parure. Size: Length 7 1/2". Width: 1". Clip On Dangle Earrings - 1" x 3/4". Designer: JULIANA. Juliana's jewelry is highly collectible and sought after. It is not signed but is distinguishable and recognisable. The design of this magnificent Juliana demi had been verified by Mr. Frank DeLizza, the son of Mr. William DeLizza. Mr. William DeLizza was one of the two founders of the DeLizza and Elster factory (D&E) who named his jewelry after his mother's first name, Juliana. Simply Sensational! This superb Juliana jewelry set is loaded with intense glitz and glamour. It emits intense sparkles at the slightest quiver. 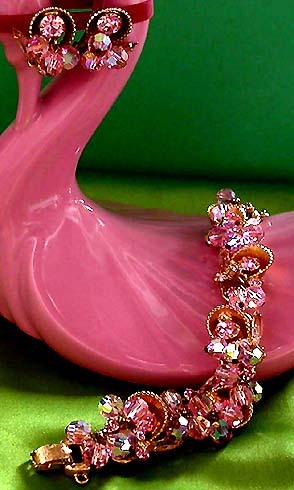 The splendid pink Juliana bracelet has the typical five-link. Each link features a goldtone scallop design holding a large brilliant cut sparkling pink round crystal rhinestone and is accentuated by an exquisite pink navette and smaller glittering pink stones! Dangling alluringly from this spectacular arrangement are shimmering multi-faceted, heavily leaded pink crystals glittering with an explosion of brilliant sparkles. The photos are unable to capture the gorgeous pink and immense sparkles. Much more beautiful in person. 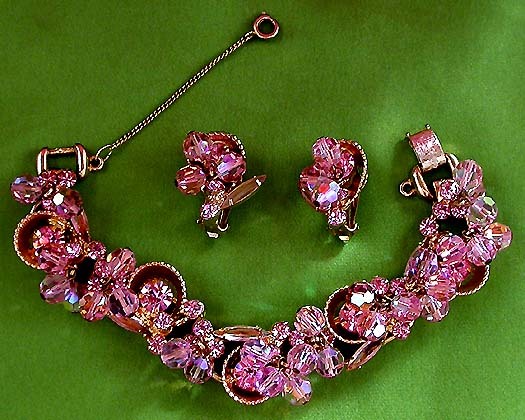 This magnificent Juliana pink crystal jewelry set is absolutely drop dead gorgeous and glamourous to the hilt. It is a show stopper, a must have and a jewelry set any woman would want to own. A Juliana creation to die for! Excellent Condition. A fabulous matching Jewelry set to wear at weddings, prom nights, pageants, parties, cruises and special functions! US$368.00. SOLD.